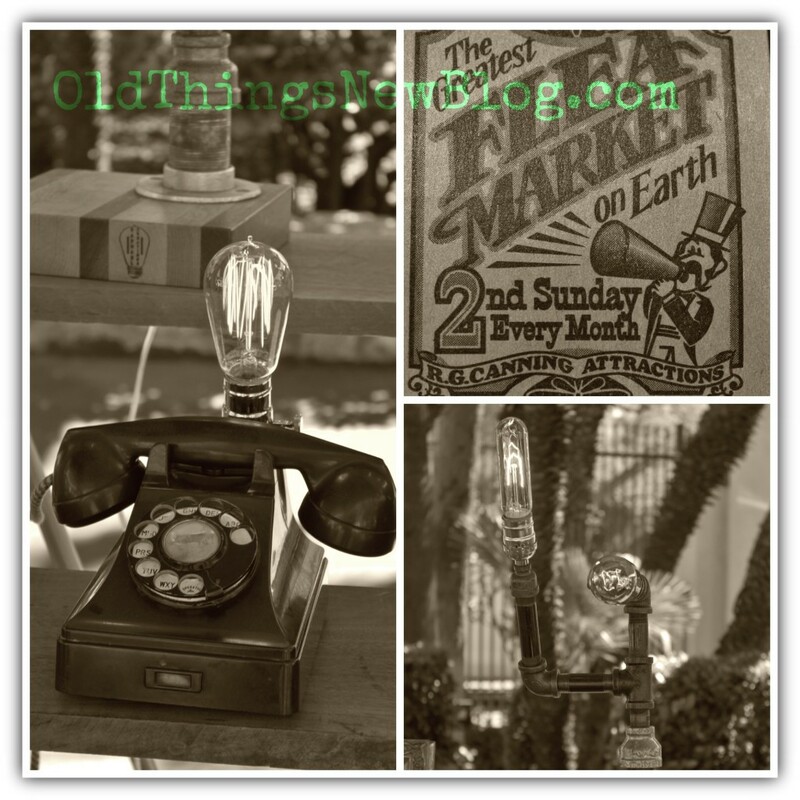 Do you remember my recent trip to Pasadena and The Greatest Flea Market on Earth? Remember all of the “to drool for” items that I captured on camera? 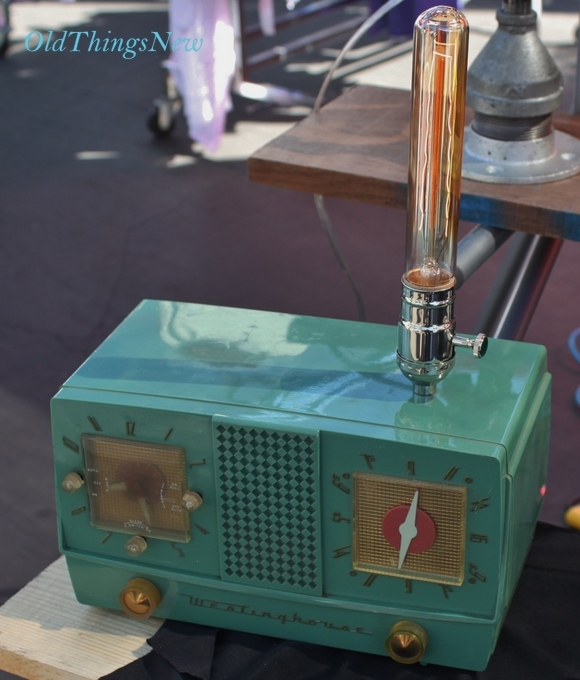 Well, there was one vendor who is so talented at doing what I myself am all about, making OldThingsNew, that I decided to save her photos for a separate blog post. 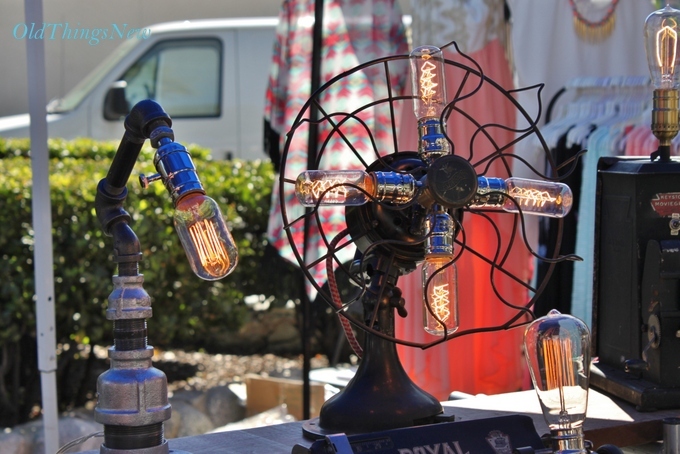 Lisa of Raphael Creations creates fun and funky re-purposed light fixtures from vintage items. 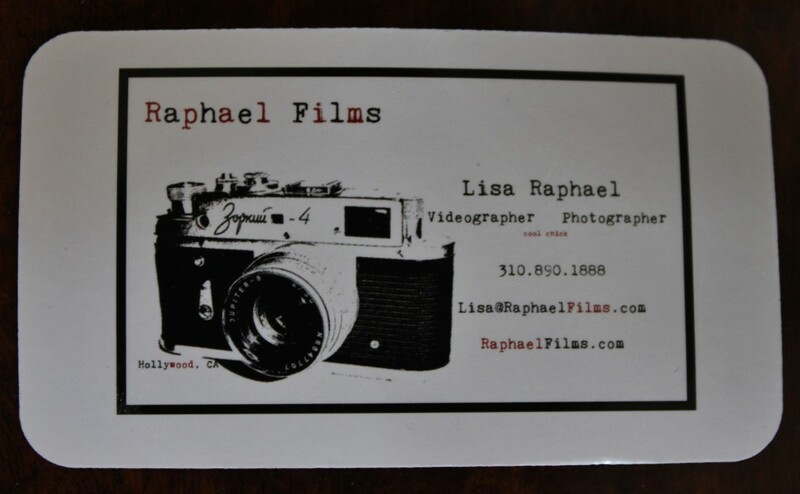 Lisa’s career has spanned 20+ years of nearly every type of job in the entertainment industry. She has always had a creative and imaginative mind (she was one of those kids who was always getting into trouble for taking apart her dad’s electronics). 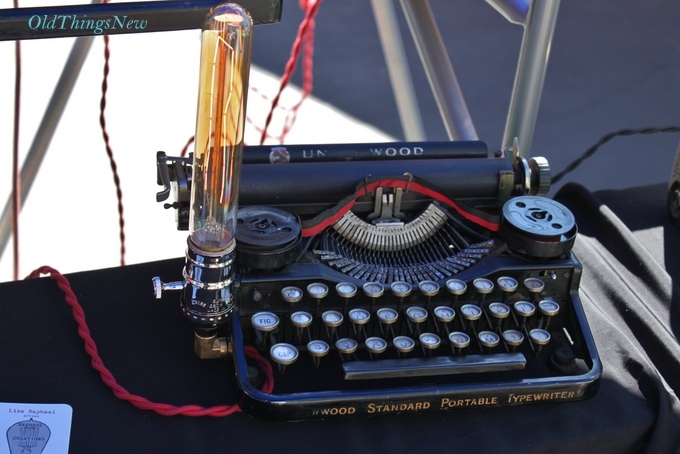 Her recent creations came out of a desire to do something with an old Underwood typewriter she owned. “Bright” idea: She turned it into a lamp for her home. 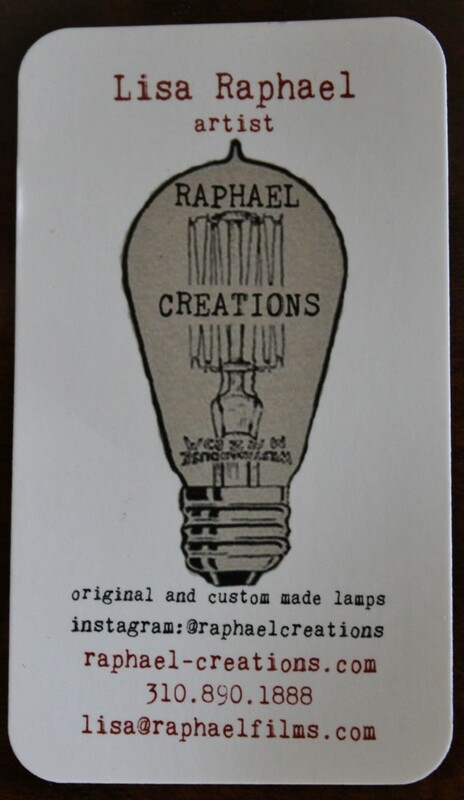 After that she was on a roll and today she creates and sells her lamps both online and in various Southern California locations. 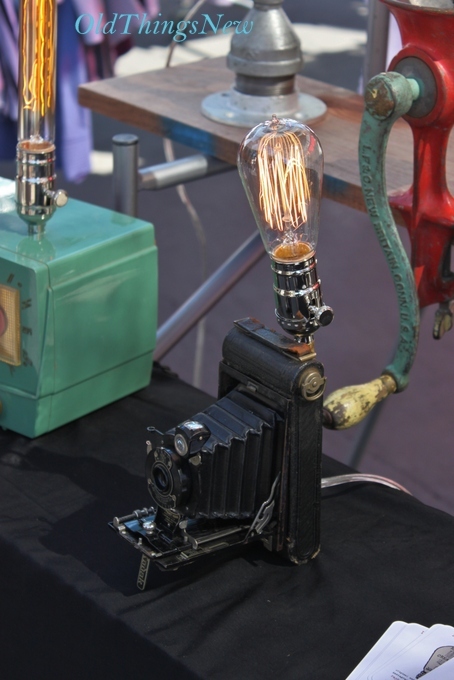 Have a look at a few of her fabulous re-purposed items! 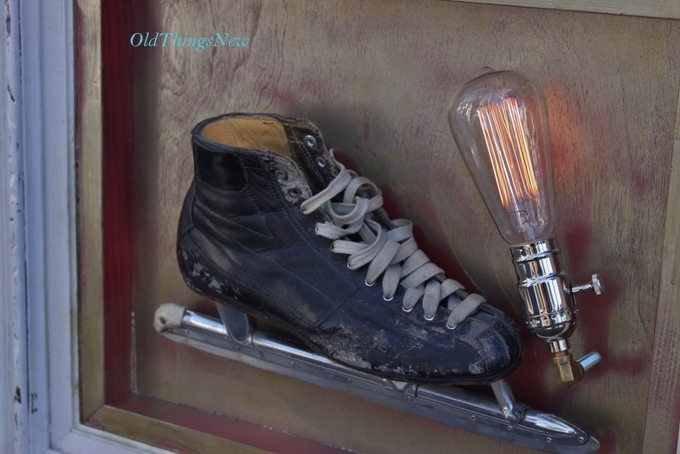 A framed ice skate lamp. A SO cool vintage fan lamp. 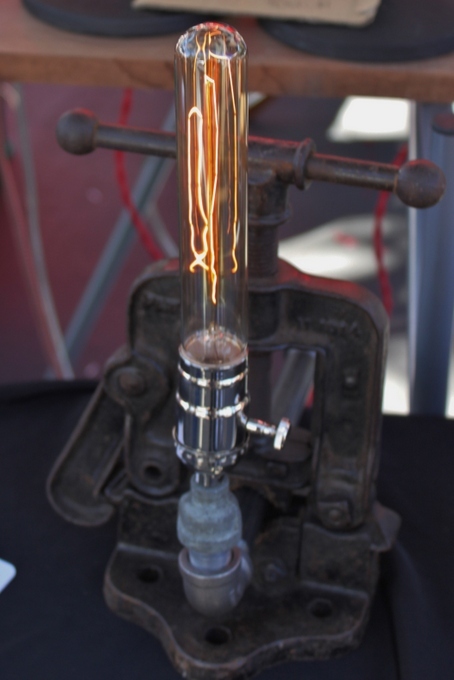 An old Westinghouse radio lamp . . . in turquoise (love)! A little extra kitchen lighting via an old meat grinder! Does anyone collect vintage cameras? I would love to have this one. Pipes and fittings light fixtures. And an old Underwood turned table lamp! I wonder if this is Lisa’s original first creation? 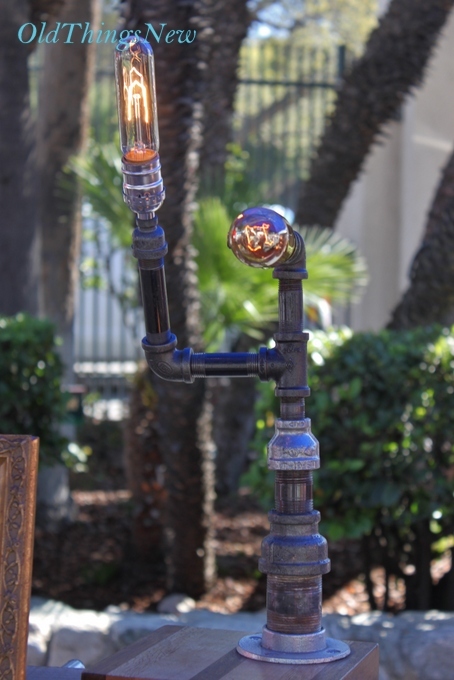 Who knew that Lisa’s curiosity would lead her to one day begin creating and selling such unique, one-of-a-kind light fixtures. 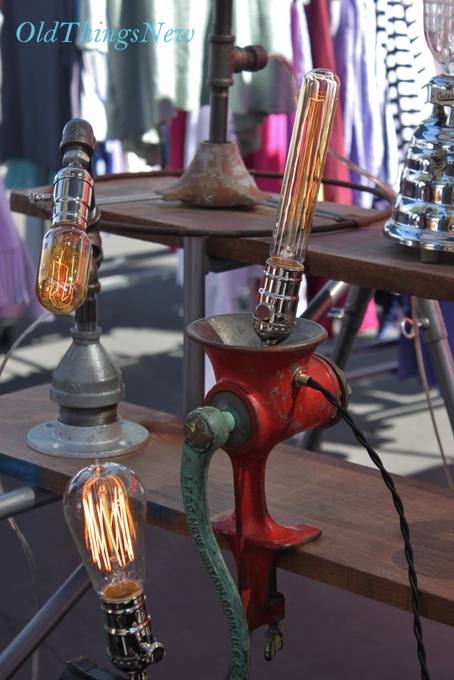 She also takes custom orders for lamps made from vintage items that you own. What a fun gift idea . . . Father’s Day perhaps? Thank you Lisa for letting me take pictures (after I promised that I wasn’t going to copy your work and admitting that I wouldn’t even know how)! You are one talented lady! Don’t you love seeing other people’s junk re-purposed into new treasures? Did you have a favorite one of Lisa’s creations? If you’d like to view more great re-purposing ideas please check out my Old Junk Transformations board on Pinterest. These are so amazingly creative! I love love love the fan! The typewriter caught my eye, my mom has a similar one. These are all very unique. Please come share at bacon time, if u have not already. Those are really clever! I am so impressed! This is so much fun! I can’t believe all the amazing ideas she came up with to make lamps. So fun to see, thanks for sharing Patti! Haven’t seen you in a while, hope all is well! This vintage pieces and inspirations are very pretty and unique. Some of them reminded me a little of Delightfull’s inspirations and lamps.